Was Jose Navarro, a federal poultry inspector who died two years ago at the age of 37, a victim of increasingly noxious chemicals used in poultry and meat production? Chemicals like ammonia, chlorine and peracetic acid that are frequently employed to kill aggressive bacteria in meat and poultry? Navarro coughed up blood several months before his death, the Washington Post reported last week and died in November 2011 of lung and kidney failure, according to the autopsy report. An OSHA inspector during a subsequent investigation said “the combination of disinfectants and other chemicals” in addition to pathogens such as salmonella “could be causing significant health problems for processing-plant occupants,” reports the Post. The plant where Navarro worked and the chicken industry defend the chemicals as safe. 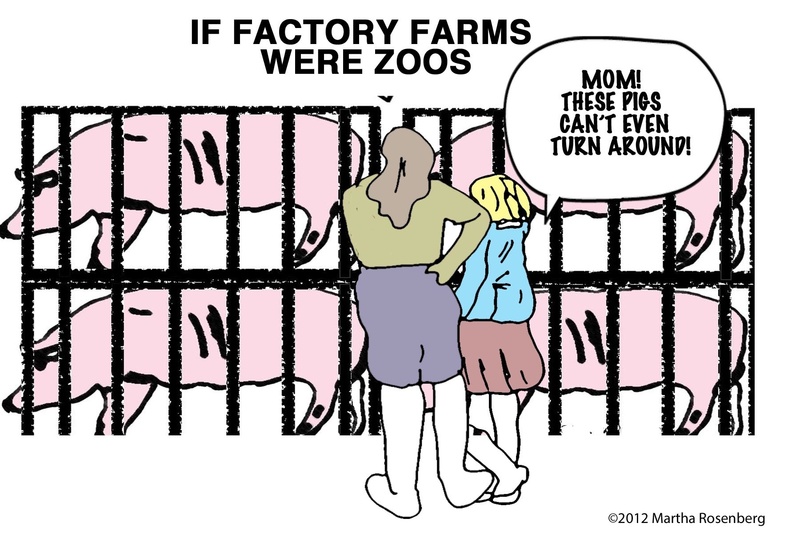 Consumers and food activists often criticize the sped up, barely-regulated operations at commercial slaughterhouses that harm workers and animals in the quest for cheaper meat. But increasingly federal meat inspectors themselves are speaking out about the broken system. “My plant in Pennsylvania processed 1,800 cows a day, 220 per hour,” and veterinarians were pressured “to look the other way” when violations happened Lester Friedlander, DVM, a federal meat inspector told the Winnipeg Free Press. The reason? Stopping “the line” cost the plant about $5,000 a minute. Dr. Friedlander was a USDA veterinarian for 10 years and trained other federal veterinarians. When Mad Cow Disease was first a US threat in 1991, Friedlander says a USDA ofﬁcial told him not to say anything if he ever discovered a case and that he knew of cows that had tested positive at private laboratories but were ruled negative by the USDA. Friedlander told United Press International that the USDA attempted to force him out after he alleged, on national TV, that meat from downer cows supplied the national school lunch program. His charge proved true and led to the biggest meat recall in US history. National Joint Council of Food Inspection Locals, the union that represents meat and poultry inspectors in federally regulated slaughterhouses, also spoke out about Mad Cow Disease risks. In a letter to the USDA in 2004, the union said that cattle parts that could give humans the disease were “being allowed into the production chain.” Heads and carcasses of cattle over 30 months old sailed through slaughter and processing lines, said the whistle blowing inspectors. “We couldn’t determine that every part out of there was from a cow under 30 months,” said Stan Painter, the union’s chairman, to MSNBC. “There was no way to determine which one was which.” Inspectors were “told not to intervene” when kidneys from older animals were sent down the line to be packed for the Mexican market, which prohibited cows over 30 months, the union charged. Cows younger than 30 months were considered to pose less Mad Cow Disease risk to humans. The HACCP system was developed by former Monsanto lobbyist Michael Taylor, which is no surprise in light of his pro-industry initiatives while working at the government. Taylor facilitated the approval of unlabeled GMO crops and recombinant bovine growth hormone (rBGH), both spearheaded by Monsanto, and has even lobbied against the Delaney Clause, which prohibits cancer-causing chemicals in food. Food activists, animal activists, consumers and even industry insiders called HACCP “Have a Cup of Coffee and Pray” and an unvarnished a gift to industry. It’s a “politically-based policy masquerading as a science-based measure” that privatizes the meat inspection process for large plants while regulating smaller plants out of business. It allows contaminated meat to leave the plant with “smaller downstream processors … left accountable for problems caused by the original slaughterhouses,” writes Nicole Johnson. Soon after HACCP was implemented, a study by the Government Accountability Project and Public Citizen found that 62 percent of inspectors surveyed allowed contamination like feces, vomit, and metal shards in food under HACCP on a daily or weekly basis, which had never happened before. Almost 20 percent of inspectors said they’d been instructed not to document violations. In fact, a full 80 percent of 451 inspectors surveyed said that HACCP attenuated their ability to enforce the law and the public’s right to know about food safety. Another federal meat inspector who spoke out about the broken system was veterinarian Dean Wyatt. The Food Safety and Inspection Service Supervisory Public Health Veterinarian from Williston, VT testified at Congressional hearings in 2010 about federal inspectors’ shocking lack of authority in slaughter plants. Plant managers openly defied the federal inspectors he said and workers followed suit, actually ridiculing them. Both Wyatt and public health veterinarian, Deena Gregory, reported that they witnessed a Seaboard employee hit an, “animal hard in the face and nose 8-12 times,” but David Ganzel, DVM, the District Veterinary Medical Specialist, deemed the acts was not “egregious,” hence not a violation, said Wyatt in his Congressional testimony. Seaboard employees began to snicker when Wyatt walked past. Food Safety and Inspection Service officials overtly served plant managers not the government, food consumers, employees or the animals. Dr. Wyatt was instructed not to file violation reports–not to do his job–and official reports were sanitized and deleted. In one report of an employee abusively throwing an animal, the word “threw” was changed to “dropped” he testified. Shortly after testifying to Congress in 2010, Dean Wyatt, DVM, died of brain cancer at the age of 59. He was a second-generation federal meat inspector and told Congress “Public service is in my blood.” His father died in the “line of duty,” he said, contracting a lethal pathogen at a turkey slaughter plant he inspected. This article was posted on Saturday, June 22nd, 2013 at 8:00am and is filed under Food/Nutrition, Health/Medical.